If you’re into fast-paced games and big prizes, 25 Card Cash is just for you! This game has been developed by the team at IWG with a classy and easy to understand layout. 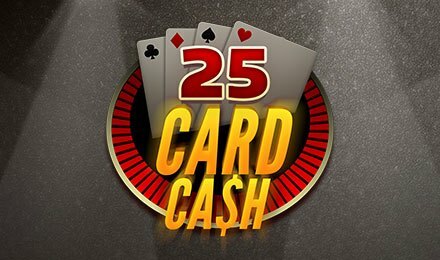 25 Card Cash is both a simple and traditional game that offers card playing experiences with instant prizes. The background of the game is dark, but the options and grid immediately illuminates the screen. In the middle of your screen, you’ll find a 5-reel and 5 row grids with the bet button on your right-hand side. Use the “Reveal All” button to display all cards. This will inform you whether you’ve won or not. When you begin to play this amazing game, you’ll be greeted with 25 face down cards. All you have to do is set your stake and work your way through the game’s board for hidden combinations. If you manage to match three, four or five identical cards, the prize is all yours. Bet Levels: There are no bet levels on this game. Amount of Line Selection: There are no paylines. Coin Values: Set your stake by clicking on the plus or minus signs on the bet field. On 25 Card Cash, if you manage to reveal the GOLD CARD, this will take you to the bonus table. At the bonus table, you’re granted with a spin on the Prize Wheel. Win big with an array of prizes on the wheel!